We highly recommend against using Norton Anti-Virus. In an attempt to be smart, they proactively quarantine programs because “fewer than 50 users in the Norton community have them”. This means many of our plugins get quarantined when you try to install them. Our installers pose no threat and you can safely install them. 1- It describes the risk as Heur.AdvML.C and labels it a ‘heuristic virus’ which sounds scary and looks like a virus name. It’s not. It’s a Norton code for their ‘artificial intelligence’. If this is how smart AI is, it’s going to be a long time before the bots take over the world. 2- Our major crimes against humanity seem to be that less than 50 users have installed this and it was uploaded over 4 months ago. That’s it. 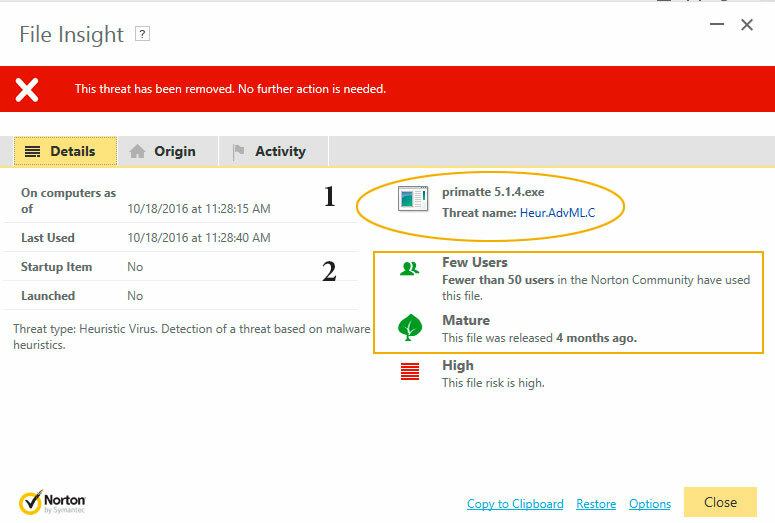 So Norton’s ‘malware heuristics’ AI has decided were a High threat. This is misleading and doing a disservice to us and our users. I assume most other plugins from small companies will fall under the same umbrella of stupidity. As such we recommend you use a different anti-virus software. The heuristic detection are also based upon how well the application is written. Poorly written code with many system calls, built with bad packers, and with no digital signature lowers the applications reputation. This is something most new antivirus systems looks into. Sign your applications and it is more likely that it won’t get detected. All our installers, as well our website which they call, are signed on both Windows and Mac. We are very up-to-date with our certificates.